1. Thomas BADNALL, son of Joseph BADNALL (c. 1736-1803) and Martha PRATT (c. 1741-1775), was born circa March 1768. He was baptised on 26 March 1768 in St. Edward's P.C. Leek, Staffs. He died on 10 June 1769 in Leek, Staffs.. He was buried in June 1769 in Near church door. St.Edward's Leek, Staffs..
2. Joseph BADNALL, son of William BADNALL and Esther BOSTOCK, was born circa 1736 in Mill Street, Leek, Staffs. 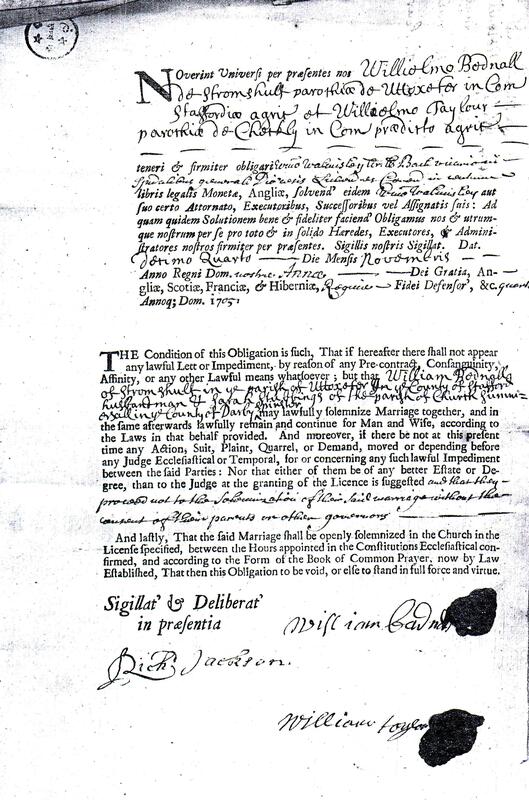 He was baptised on 2 April 1736 in St. Edward's P.C. Leek, Staffs. He was a Silk Dyer. He married Martha PRATT on 17 November 1764 in St. Edwards, Leek, Staffs. He died on 24 April 1803 in Leek, Staffs.. He was buried in April 1803 in St. Edwards churchyard, Leek. 4. William BADNALL, son of Christopher BADNALL and Sarah WHIELDEN, was born on 30 July 1699 in Uttoxeter. He was baptised in July 1699 in St. Mary's, Uttoxeter, Staffordshire. He was a Mohair and silk dyer. He married Sarah WOLRICH on 25 November 1723 in Madeley, Staffordshire. He married Esther BOSTOCK on 31 July 1733 in St. Edward's, Leek, Staffs. He died circa December 1760 in Mill Street, Leek, Staffs. He was buried on 13 December 1760 in St. Edwards Churchyard, Leek. William Badnall (d. 1760) of Mill Street worked as a dyer by 1734 and possibly by 1725, with dyehouses by the Churnet in Abbey Green Road at its junction with Mill Street. He was described as a mohair dyer in 1736. In 1758 he bought the bankrupt Richard Ferne's linen-thread works on the opposite side of Abbey Green Road, which included a dyehouse by Ball Haye brook. It is not known that he ever engaged in silk dyeing. The Badnall family's works was engaged in silk dyeing by the 1780s under the management of William's son Joseph. When Joseph Badnall died in 1803, his dyeworks was taken over by his son William and brother James. On William's death in 1806 a partnership was formed between James and his brother Richard and son Joseph. James died in 1813. By 1826 the works was run by a partnership consisting of Richard's son Richard, F. G. Spilsbury, and Henry Cruso; the partners also manufactured silk and silk machinery. The partnership was dissolved that year. The business was bought by James Badnall's son Joseph, on whose death in 1830 it passed to his sister Ann. She let the works to John Clowes, who died in 1833. The Commercial Bank, also in Market Place, was opened in 1825 by a partnership consisting of Richard Badnall of Highfield House in Leekfrith, his son Richard of Ashenhurst in Bradnop, R. R. Ellis, Henry Cruso, and F. G. Spilsbury; all, except apparently Ellis, were connected with the silk industry. The partners were reduced in 1826 to the elder Badnall and Ellis. In 1827 the partnership was dissolved, and Ellis was left to close the bank at a heavy loss to himself. His eldest son William (d. 1896) and another son Joseph (d. 1908) went into partnership in 1850 or 1851 with William Beaumont Badnall; William was then living at Pickwood, Joseph at the Derby Street house, and Badnall in Church Lane. In 1854 Badnall became the son-in-law of Francis Cruso, and he apparently took over most of the Cruso practice. William Badnall, a Leek silk dyer (d. 1806), was also a philanthropist, and on his death left the interest on ?,000 to be distributed in blankets, quilts, clothing, and other necessities such as coal but not food or drink on 5 November to 20 poor widows aged 60 or over; half the widows were to be residents in Leek town and half in Lowe. Because an insufficient number from Lowe were eligible, the number of town widows who benefited in the earlier 1820s was 13.
market every Wednesday. Leek flourished in the 19th Century following the Industrial Revolution with the advent of the textiles industry and also had strong links with the Arts and Crafts Movement. The houses at Churnet Manor each pay homage to four integral pioneers associated with Leek and its textiles: William Morris, William Badnall, Thomas Wardle and Richard Norman Shaw. Thomas BADNALL (c. 1725-1725). 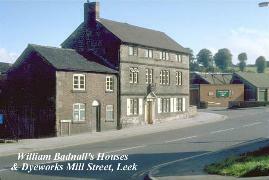 Thomas was born circa 1725 in Mill Street, Leek, Staffs. He was christened on 20 August 1725 in St. Edward's, Leek, Staffs.. He died in 1725 in Leek, Staffs.. He was buried on 29 November 1725 in St. Edward's Leek, Staffs. John BADNALL (c. 1726-1793). John was born circa October 1726 in Mill Street. He was baptised on 5 November 1726 in St. Edward's P.C. Leek, Staffs. He was a silk merchant. He married Elizabeth JACKSON circa 1757. He died in October 1793 in Leek, Staffordshire. He was buried on 20 October 1793 in In the church of St. Edwards, Leek.. There is a plaque in the tower. Sarah BADNALL (bap.1729, d.1805). 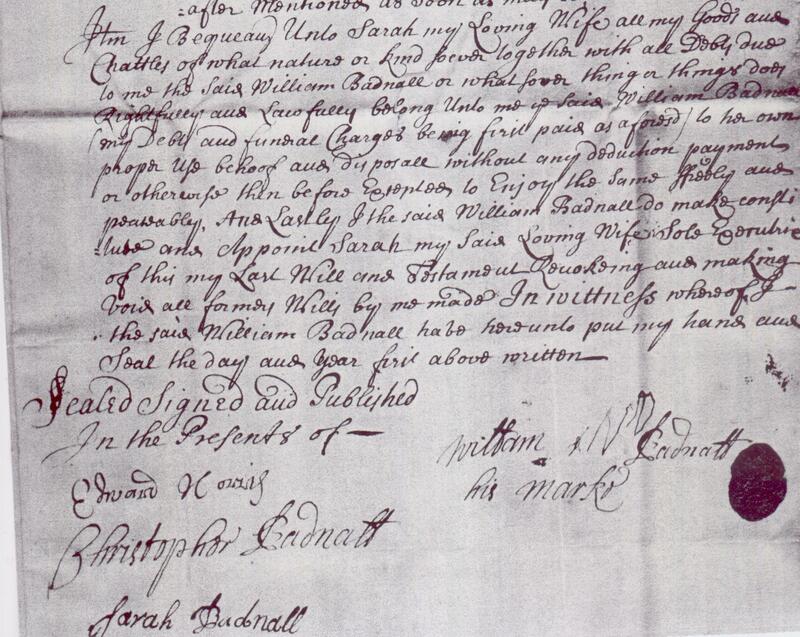 Sarah was baptised on 28 August 1729 in St. Edward's P.C. Leek. She married Thomas SMITH on 1 January 1751 in Wybunbury, Cheshire. She died in February 1805 in Leek. She was buried on [Julian] 11 February 1805. She was buried on 11 February 1805 in St. Edwards, Leek. Elizabeth BADNALL (c. 1731-c. 1758). Elizabeth was born circa 1731 in Leek. 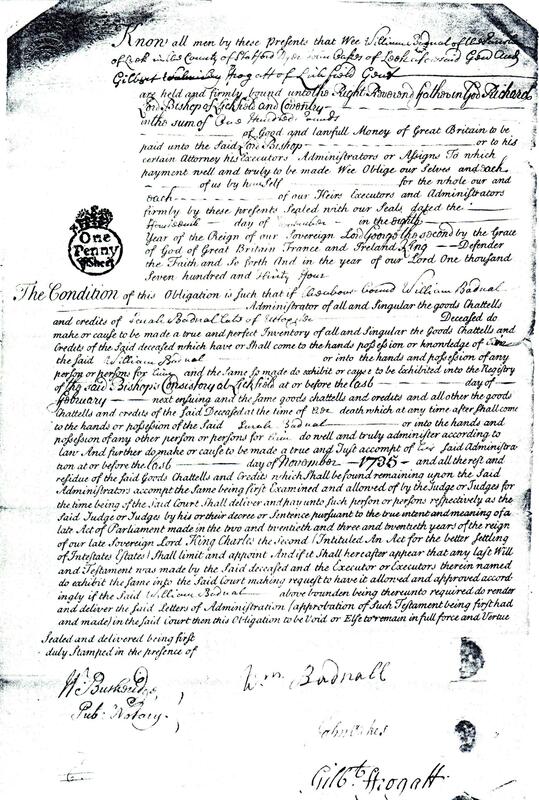 She was baptised on 10 December 1731 in St. Edward's P.C. Leek. She died circa 1758. She was buried circa 1758 in St. Edward's P.C. Leek. Esther BADNALL (c. 1738-1765). Esther was born circa 1738 in Leek. She was baptised circa 1738 in St. Edward's P.C. Leek. She married Richard PRATT on 10 July 1762 in St. Edward's P.C. Leek, Staffs.. She died in August 1765 in Leek. She was buried on 1 September 1765 in St. Edward's P.C. Leek. William BADNALL (1743-1777). William was born in February 1743 in Mill Street. He was baptised on 15 February 1743 in St. Edward's P.C. Leek. He was a Thread Manufacturer. He died on 2 April 1777 in Leek. He was buried on 4 April 1777 in St. Edward's P.C. Leek. James BADNALL (1745-1813). James was born on 10 January 1745 in Leek. He was baptised on 12 January 1745 in St. Edward's P.C. Leek. He was a button merchant, later a silk dyer. He married Martha BARNETT in August 1767 in Cheadle, Staffs.. He died in January 1813 in Mill Street, Leek, Staffordshire. He was buried on 14 January 1813 in St. Edwards. Charles Bostock BADNALL (bap.1734, d.1735). 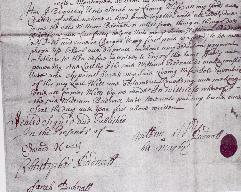 Charles was baptised on 29 July 1734 in St. Edward's P.C. Leek. He died in September 1735 in Leek. He was buried on 12 September 1735 in St. Edwards. Ann BADNALL (bap.1740). Ann was baptised on 26 July 1740 in St. Edward's P.C. Leek. 6. Thomas PRATT (also known as [unnamed person]) was born in 1709. He was born in 1709 in Leek, Staffs.? He was a Joiner. He died in April 1791 in Leek. He was buried on 2 April 1791 in St. Edward's P.C. Leek. He married Isabella LANCELLOT.